With its compact growth habit and mat-forming foliage, 'Aurea' is a wonderful choice for smaller gardens. Soft, silvery foliage and broad, yellow bloom clusters make it the perfect compliment to a multitude of bold or subtle garden companions. Ideal choice for beds, borders, and cutting gardens. Makes a dependable mixed border plant. Cut flowers are long-lasting in fresh bouquets. 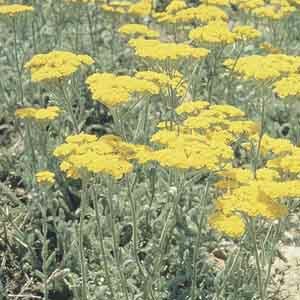 Terrific plant for butterfly gardens. Very easy to grow in virtually any location. Plant in ordinary, well-drained soil. Keep soil moist, watering freely in dry weather. Remove faded flowers for best display.